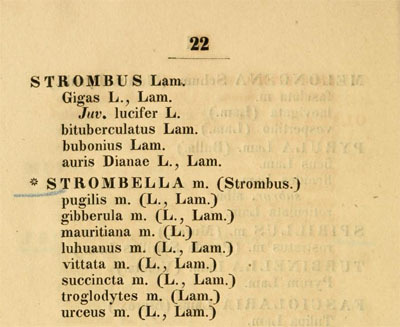 Strombus is often used in a broad sense. Some of the Strombus defined by Petuch are in discussion. "In my opinion, shared by Bernie Landau and others, Strombus (in the restricted sense of Abbott) is a relatively young development, restricted to the Caribbean and Panamic Fauna province." "In mollusks of the genus Strombus, the operculum is a defense from enemies in the strict sense. It is hard, long, narrow and has sharp serrated edge. The mollusk can use it as a knife against predators such as certain fish, crabs, mollusks (e.g., Fasciolaria fulica), and other invertebrates. The injuries caused by this sharp and hard operculum can be deep and painful even for humans, particularly, in case of large mollusks." "In contrast to many other mollusks, the operculum of Strombus cannot be used to isolate the soft tissues from the environment, since it is not long and wide enough to close the aperture. (...) Instead, it has an equally important function of support and is used by Strombus to jump on the substrate�forward and even backward." was used by Aristotle in a broad sense. Anton, H. E. 1839. Verzeichniss der Conchylien welche sich in der Sammlung von Hermann Eduard Anton befinden. Pp [I-XVI] + 1-110. Knorr, P. O. (2006). The case for high-order, pleistocene sea-level fluctuations in Southwest Florida (Doctoral dissertation, University of South Florida).